When you come to our dance studio in Airdrie, we want your success as much as you do. That’s why we would like to make the etiquette of the dance floor very clear before you even take your first dance lesson. 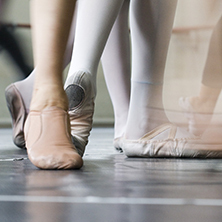 If you plan on taking dance classes for a long time, you can set yourself up for success by learning the rules now. This ensures you have the best experience possible. To make the most out of your dance lessons at our studio in Airdrie, we have composed a list of dos and don’ts of dance. In the dance world, being early is on time, and being on time is late. You want to make sure you arrive to each class with a few minutes to spare so you can stretch, get your shoes on, put away any personal items, and mentally prepare. Just make sure to be respectful of any dancers who are currently in class so as to not distract them. Every dance class at Star Bound Dance Company has a dress code for a reason. Dressing in accordance with the dress code sets the tone for how you are seen by your instructor and the rest of the class. In addition, the dress code is designed to ensure you can move freely in line with the choreography. Don’t think that you can just wear whatever you feel like when you’re in class; there are rules for a reason. You want to make sure that you can see the dance instructor, and the instructor can see you. Find a window where you fit, and make sure that the dancers on either side of you have plenty of space to move freely. Wherever you must go on the dance floor, look for opportunities to create greater balance. For example, if you are waiting in line for across the floor progressions, make sure there is an equal number of dancers in each line. Your body language speaks volumes for you. If you are staring into space with your arms crossed, you send a clear message: you’re disinterested. This may mean the instructor invests less time and attention into you and can be distracting to the rest of the class. If you really want to make the most out of your dance lesson, stand with attention and keep your eyes on the instructor. DO: Bring a Positive Attitude. After a long day, dance can act as an escape from your troubles. Once you walk onto the dance floor, leave your troubles behind. Smile, share your passion for dance, and have a positive attitude. At the end of the day, you get out what you put in, so put in all of your hard work, positivity, and openness to ensure that’s what you get back. Whether you want to take ballet, jazz, hip hop, or tap dance classes, we would love the opportunity to teach you at our dance studio in Airdrie. Contact Star Bound Dance Company to learn more about our dance classes!